Visual discrimination helps a child to see subtle differences between objects or pictures and to see if something matches up. This visual perceptual skill can be described as “paying attention to detail”. How Does Poor Visual Discrimination Affect Kids? 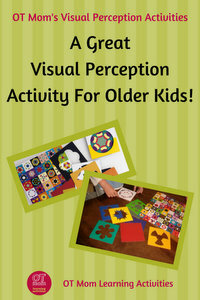 Try these activities and games to help your child develop this essential visual perceptual skill. Click on the quick links below to view instructions and photos for each game. 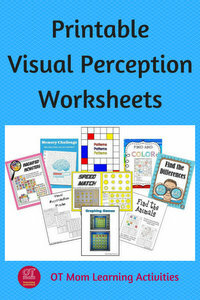 These visual perception activities are intended to encourage your child's normal visual perceptual development. 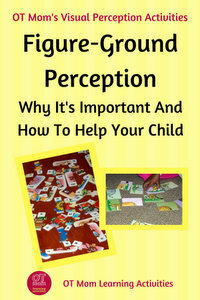 If you suspect your child has visual perceptual delays, please seek a professional opinion. Your preschool child can sort household objects such as cutlery, or get involved in matching socks! You can also go on a nature walk and collect seeds, leaves and so on, and have your child sort them into groups of similar / identical items. Ask your child to sort shapes and colors, or mix up a few handfuls of different shaped pasta and ask your little one to sort them into an egg carton or muffin tray. 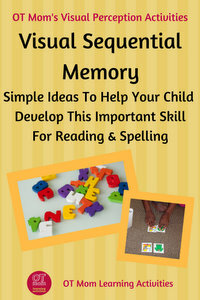 Teaching your child to pay attention to detail is an important step in developing good visual discrimination skills. These 3 and 4 piece puzzles are different to conventional puzzles in that the cards have straight edges, and the pieces are mixed up with other pieces. Your child then has to pay careful attention to the color and lines of the picture in order to correctly build the animal. Lotto-Type Games encourage your child to pay active attention to spot the small differences between the playing cards. You don't even have to play it as "Lotto" - just present your child with the different cards as shown, and ask him/her to match them up. Graphing Games require the child to look at the object and then place it in the correct position on the “graph” according to the color and contents of the picture. I was unable to find a similar product to mine to recommend online, but this download of reproducible Graphing Games sheets is fantastic. Use a set of matching cards. Place a few picture cards on the table (one of each pair). Then hand your child one or the remaining cards and ask him/her to find the matching card from the pool on the table. Increase the figure-ground demand of this activity by increasing the number of cards on the table. Matching shadows or matching the outlines is a good way visual discrimination activity. Or you can purchase this inexpensive visual perceptual e-book that contains shadow bingo printouts like the ones shown below. Look out for sheets in your child's shop-bought activity books that require your child to pay attention in order to match identical outlines. 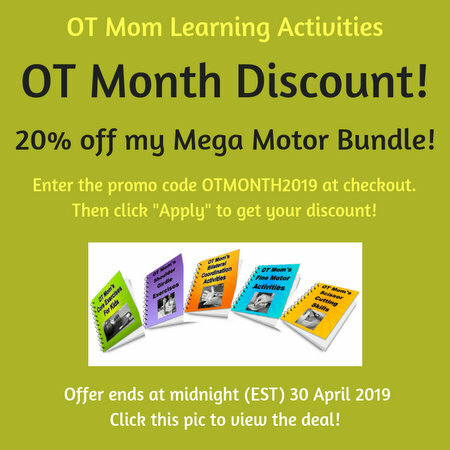 These are some useful resources that I have used with my own kids and in therapy settings. Although I prefer hands-on activities, there is sometimes a place for worksheets and paper-and-pencil activities. 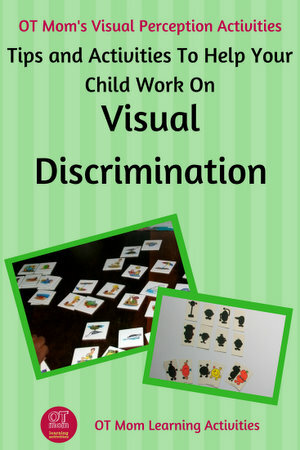 PFOT stock a range of great visual discrimination games and activities. I have picked out a few that are very similar to the ones I have used in South Africa. Therapy Products to work on visual discrimination skills. I link to some products on Amazon and PFOT for your convenience. These are affiliate links and I receive a small commission if you purchase a product through my links. However, you are under no obligation to purchase anything! 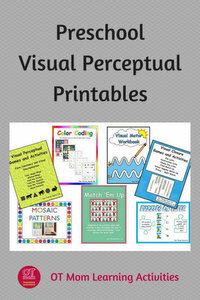 Here are some more visual perceptual pages that you may find helpful! I trust you found this page helpful! Thank you for visiting my site!